More than 2,000 people including Brits had to flee their homes after “suspicious fires” were sparked in a holiday hotspot near Benidorm. The blazes – feared to have been started by an arsonist – erupted in Javea, south of Valencia, where half of the 30,000 population were born outside Spain. Those who live near where the inferno broke out were rushed to local schools, restaurants and hostels where it is believed they are still sheltering. So far, at least 20 homes have been destroyed by the fire and Spanish media is reporting that the cause of the blaze is arson. Police are investigating the cause of the fire, which they are describing as "suspicious"
Spanish news outlet Diario Informacion claims to have spoken to a researcher who claims they have "no doubt" the fire was caused by an arsonist. This has yet to be confirmed by police. The area is extremely popular with British tourists, with homes in Benitatxell, Tossalet and Cansalade also being evacuated as a precaution. The fire was thought to have been under control earlier in the day, but new outbreaks have seen the blaze escalate. 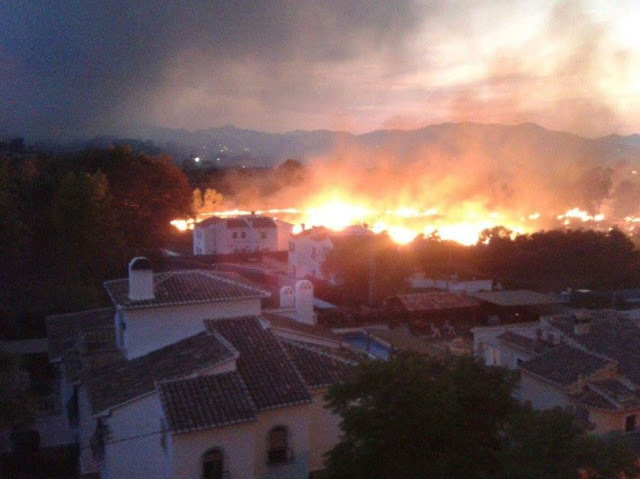 The first fire broke out at the Cumbres del Sol at 4.10pm local time, with the next one starting at 6.30pm in Granadella. The third fire then broke out at Playa del Arenal at 8.30pm local time. The three fires surround thousands of home in the popular holiday region. It is believed the first set of fires broke out at the Villes del Vent and Cansalades Park. Police closed the road between Cansalades and Cami Cabanes, and then proceeded to evacuate residents in Valle del Sol, Valsol, Pinomar, Pinosol and Tossalet. Thousands of locals were evacuated by the Civil Guard. Spanish police had to arrest one homeowner who refused to be evacuated. Aircrafts have been drafted in to help combat the fire by dropping gallons of water onto the inferno. Probably started by the Muslim invaders, who are setting cars on fire in other parts of the EU. (gatesofvienna.net andpamelageller.com) EU leaders are enabling this invasion which has "passed the point". And setting forest fires in the Rockies and Sierras inside the United States. Ah, another Moorish invasion of Spain.